1880s The Greengate and Irwell Rubber Co, Stephenson Street, Canning Town, originated in the 1880s. 1882–6 The Irwell (later Salford and Irwell) India Rubber and Gutta Percha Works Ltd had premises at the Royal Albert Dock. In or before 1904 it merged with the Eastern Rubber Co, Tidal Basin, first listed in directories in 1886, to form the Irwell and Eastern Rubber Co.
1914 It is not known how far these firms made, rather than sold, rubber before 1914, but in that year the Irwell and Eastern Rubber Co built a factory in Stephenson Street. 1919 Public company. 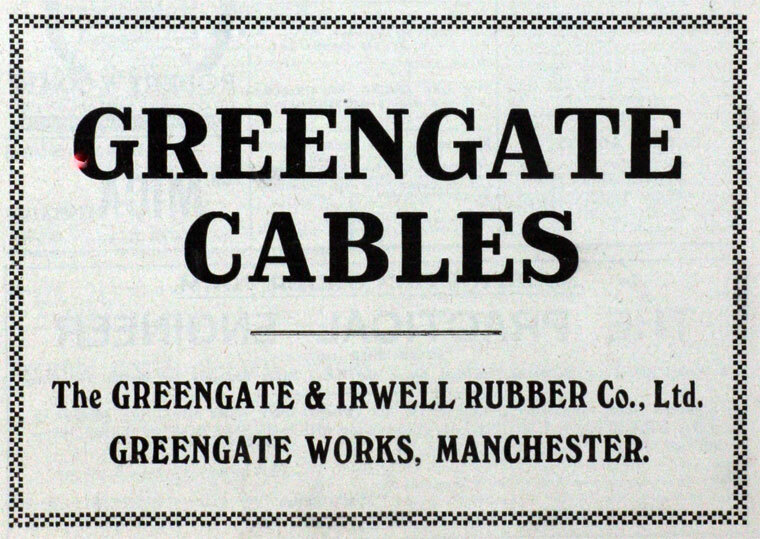 Greengate and Irwell Rubber Co Ltd was formed by the amalgamation of two companies, with factories at Manchester, Radcliffe, London and Glasgow, including acquisition of the Frankenburg business. Greengate mainly produced rubber belting and tubing, V-ropes, hose, cables, proofed fabrics and clothing. Rubber footwear represented only a small proportion of its sales in the United Kingdom. 1921 Irwell and Eastern merged with I. Frankenburg and Sons of Salford, Lancashire, to form the Greengate and Irwell Rubber Co.
WWII. The firm lost its Canning Town works by bombing in the Second World War and afterwards retained only a small depot there. 1961 Manufacturers of plastic rubber and balata** conveyor and transmission belting, moulded and mechanical plastic and rubber goods, industrial hose for all purposes, rubber flooring, latex thread, outerwear and protective clothing, plastic and rubber speciality proofed cloths for industrial purposes, printers' blankets, rubber footwear, card cloth and plastic and rubber insulated cables. 2,500 employees. 1967 and 1968 Greengate and Irwell was acquired by Slater, Walker Securities Ltd.
1971 Allied Polymer acquired the company including its subsidiaries in industrial polymers, cables (Greengate Cables), coatings, protective clothing (Glyn Protective Clothing Ltd and A. and E. Bye Ltd), inflatable boats (Beaufort (Air-Sea) Equipment Ltd). Balata - the gum of the bullet- or bully-tree of South America, used as a substitute for rubber and gutta-percha (a substance like, but harder and less extensible than, rubber). This page was last edited on 25 July 2016, at 10:42.